MAN graphics on the engine. 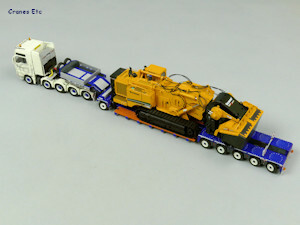 Loaded with a Vermeer Terrain Leveller. 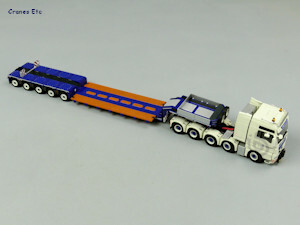 The tractor is a MAN TGX XXL 10x4 Euro 6 and the trailer is a Nooteboom Euro-PX with 5 axles and a 1 axle interdolly. It is in the colours of the Dutch company Twan Bierings. 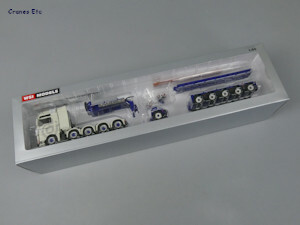 The packaging is the usual style of WSI branded box. There were no missing parts or defects on the review model. The extending beams on the trailer appeared to be installed upside down but they easily pull out and are reversible. 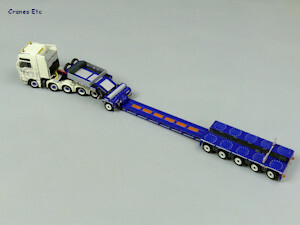 An instruction sheet describes the assembly and features of the trailer. It also has interesting information about the real trailer. A certificate is also included although it is not uniquely numbered. 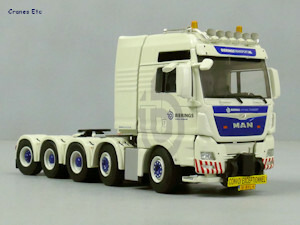 The MAN tractor chassis is an 8x4 with a typically detailed transmission modelled, including the gearbox. 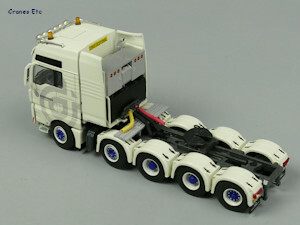 The wheels are very detailed with different tyres on the front and rear axles. The cab is detailed with windscreen wipers, orange beacon lights, and an authentic number plate, and there is a towing hitch at the front with a signboard. The cab interior is reasonable. The Gruber decoration on the cab is very nice. Under the cab is a detailed engine bearing the MAN name. Behind the cab, the equipment tower is very detailed with a fan enclosed in a mesh protection, and there are coiled lines behind. 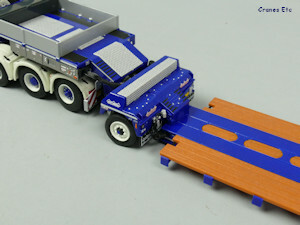 Diamond plated surfacing extends to the fifth wheel. At the back, the lights are nicely detailed and there is an authentic number plate. The rear towing hitch has a guide. 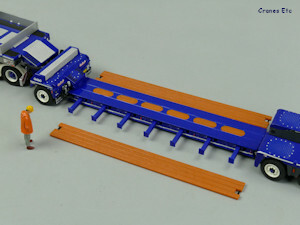 The trailer is made up of the gooseneck, a 1-axle interdolly, the spine beam, and 5-axle Pendel X module. The gooseneck is a metal part. The control console on the left side has tiny graphics. At the rear a set of hoses / cables are ready to plug into the interdolly or deck spine. Two spare wheels are fitted at the front and plastic width markers can be clipped on, although the fit was not good on the review model. The 1-axle interdolly is a nice part. It is very detailed and the authentic look is highlighted by the use of many tiny graphics, and on top the painting of the casting highlights bolt heads around the access plates. 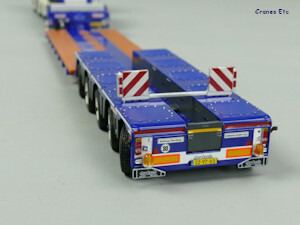 The 5-axle unit is also detailed. It features a deep central trough which is an advantage of this trailer design so that the boom of a transported load can be folded low. Graphics are used to provide the detail on the inner edges and tie-down loops are reproduced within the casting. A width marker board assembly fits on top. The spine beam is a metal part with some inlaid plastic deck surfacing. 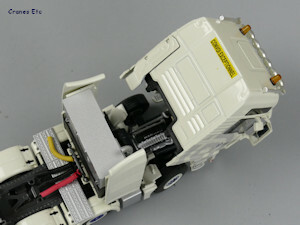 The edges are detailed with painted tie-down loops. Plastic extension beams hold the replica timber deck width extensions. 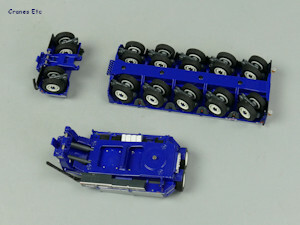 The MAN tractor has linked steering on axles 1,2 and 5. The range of movement is limited. 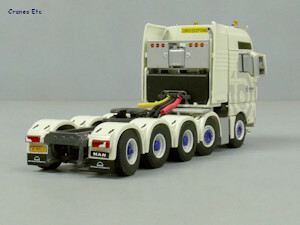 The cab tilts forward to about 45° and can pose in the tilted position. The gooseneck has stiff working cylinders so different angles can be set. It can be connected to the interdolly, and a spacer piece is provided for use if connecting directly to the spine beam. 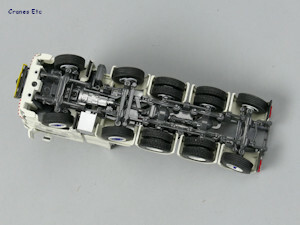 The steering is proportional on the 5-axle module and parallel on the 1-axle. The steering mechanism works reasonably well and a decent angle can be obtained. The deck can be configured with just the spine beam or with the width extensions. This model is high quality with a high metal content and plastic used appropriately. The model is decent value. 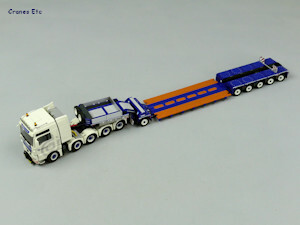 It is an attractive heavy haulage model, and looks impressive with a suitable load. It has a high standard of detailing. 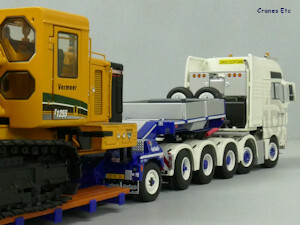 The model appeared in February 2018. 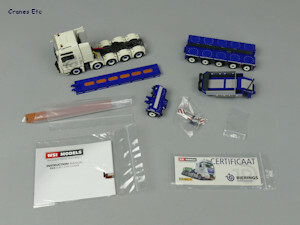 Many parts, instruction sheet and certificate. Coiled lines and tower behind the cab.